Successfully Added 5MP Digital Camera and 720P Camcorder with Optical Telescope Zoom and Wide-angle Lens to your Shopping Cart. 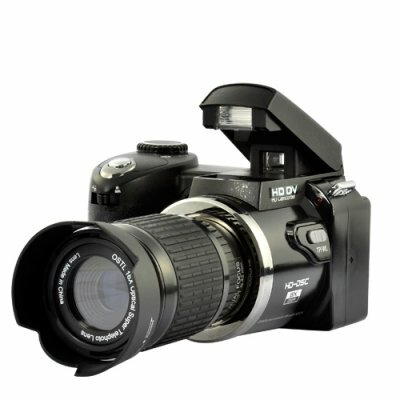 Snap high quality pictures and videos with this ultra-portable handheld digital camera and camcorder. With great telescope style optical zoom lens and wide-angle lens, this is a professional grade camera at an affordable price. This handheld Digital Video Camera comes in a small size while packing a lot of performance in its compact frame. It is smartly designed with an easy to view 3.0 inch screen, convenient recording buttons, and on-the-fly memory expandability with standard SD cards. It’s capable to take up to 16MP still photos or 720P MPEG4 videos at 30 FPS. Better yet, this DV camera comes with a standard screw-on optical telescope zoom lens, and a wide-angle lens allowing you to take pictures of long distance objects and at a wide angel. The zoom lens also has a manual focus adjustment, giving you ultimate control over the focus and quality of your distant shots. When combined with the camera's native 8x digital zoom, you then have a monster of a zoom camcorder! This camera comes out of the box ready to start taking video and pictures. We make it even easy with direct shipping and factory direct low china wholesale price and we'll even dropship it to your customer. Available for single piece or stock orders now, from the leader in direct-from-factory electronics, Chinavasion. Everything you need to get started is in the box, including 16x optical zoom telescope lens. At photographing in a building with flashlight happens changes colour. Photographed green colour and in a photo left yellow. Well is more feasible flashlight. The complete set has come all but for some reason there is no cord to an exit or input HDMI. Convenient in use, simple options in programs. The back background of a photo turns out little bit washed away. It is a pity that there is no auto focus. And so the camera excellent. I recommend to purchase.